I think you could possibly be mistaken here pal. A halogen GU10 fitting will power up an LED GU10 no probs. The clue is on the fitting GU10. Unless of course you don't have GU10s. 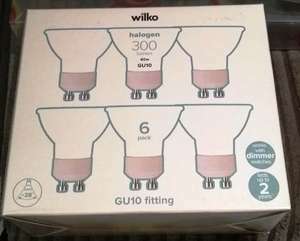 More probably 12v halogens which are not mains GU10s. Transformers for 12v downlighters typically don't support the low current draw that LED bulbs use and will usually either not work at all, flicker or flash, and may also not support dimming at all. I ordered this and mine came brand new. Got it yesterday and it’s all set up and registered. Works fine. That doesn’t work when it is already ‘used’. For this to work the hub will have to be brand new. If this is on amazon warehouse what are the chances of someone’s account already registered to the hub? 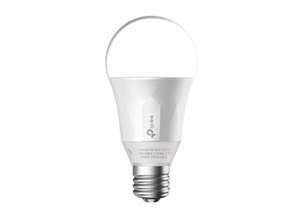 Great price, and it is also the new generation bulbs! Cheapest it has ever been I believe. 8 left it shows. Good idea if someone needs these for their new home. Seems like the new gen has a 230 beam angle rather then 180 and looks werid. This is a great deal. Just note that they are the lower 50w equivalent models LB100 instead of the 60w equivalent LB110. I see there is a new generation model out now too, no idea what changes have been made. And yes the TP-Link bulbs come with an ES to BC Adapter. Voted hot! This may be some sort of special bulb, my deal, Philips Hue twin pack for £15 went freezing cold. I bought some (a different model) and it comes with another adapter inside the pack. If the screw type doesnt fit the lamp, the other fitting will. Fingers crossed it stays that way for you. Had 2 of them for 6 months, no issues whatsoever. warning drug abuse can be detrimental to your health, especially your brain. You are lucky, Amazon have said that there are major issues with them and they may have to pull them for a while if they cant get to the botton of the issue. I bought mine last October and had it replaced in November and then again in December and then again in January and then in March. I've had these since last year, no issues at all. Been waiting for these to drop for a while, great price Choice of Screw or Bayonet for the bulb included at this price. So I found the problem - the BT whole hime has a known issue where it randomly blocks or pauses devices - sometimes even when they are wired (and not connected to WiFi at all). The fix seems to be to check the devices page in the app and 'forget' the devices - which unpauses them. I’m new to smart bulbs. Is this the cheapest sort of price for a smart bulb or are there cheaper and maybe simpler ones around? Do these go dimmer than the Gen 1 bulbs? I've found a fix. Temporarily rename your BT Whole Home SSID to something else and enable and rename your router's SSID to whatever your usual network SSID name is. Then add the Yeelights to the Yee app again. After they're working in the Yee app, rename everything back to how it was and they should remain connected to the 2.4ghz band of your network emitted by the BT Whole Home Devices. Hope that helps. Is there a bayonet B22 to GU10 converter in existence? I would like to use these bulbs but all my home connectors are B22's. Four pack of G9 halogen 20 watt capsules for 60p in Asda Hunts Cross. They had about ten packs left in first part of sale isle. Never miss a 'Bulb' deal again! Seems a decent price. Basically getting a dot for free with it. I'm fairly sure Home-bargains also have the exact same kit for similar money if anyone needs one without the Amazon minimum £20 spend. Alternatively unsubscribe from their emails or mark as junk. DON'T BUY from T&amp;M, they will spam you with endless emails you cannot stop. Thanks OP I Love it!!! Never thought I'd see the day when I couldn't afford a (fancy) light bulb. Really annoys me that people vote cold but won't say why. As far as I can see this is a price reduction so added heat. Yes there are good deals which are cheaper from China, but this is screw fix. I received a letter through the post and there is this link showing the offer. I'm sure if you called them they would honour of it's on their site.... although their customer service has to be the worst I've experienced. Tried that just now...’The promotion code N9MKK is invalid’. Your picture shows N9MKK not N9MJN. The E27 Hue Starter Kit in the link and the B22 Starter Kit just in case. Neither worked I’m afraid. Annoying because it’s a great price for the kit! From my order confirmation email ^ Strange that this only works for some? What item are you trying it on? To be fair, I don't think its a bad deal, probably suffers from being E27 bulbs (mostly bayonet in the UK), and that the Black Friday deal was so good, its hard not to compare - £90 minus the switch, but did include an Echo Dot 3rd Gen (time machine required). Thanks, upon seeing HotUKDeals unanimous verdict that this is cold, I cancelled my order. I've purchase a 'as new' E27 Hue bulb from Amazon, and it arrived completely dead. Fortunately Philips Hue support is excellent, and a fortnight later, I received a brand new replacement. So just be cautious of Amazon's description, as clearly my 'as new' item was never tested. 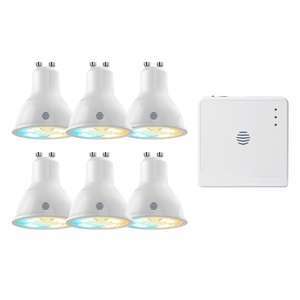 Cold.... there are much better deals for good quality colour changing smart bulbs...e.g. 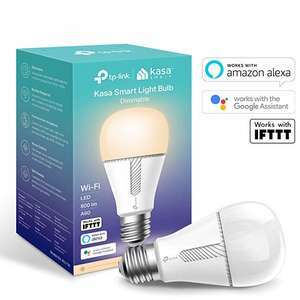 Costo sell 2 x BC with ES27 adapters for £35.99 by Feit Electric.. https://www.costco.co.uk/Electronics-Security/Smart-Technology/Smart-Lighting/Feit-Smart-WiFi-LED-A60-Colour-Changing-Light-Bulb-2-Pack/p/272807. Also note that filament LEDs have a different radiation pattern from other types of bulb: they do not produce much light from the end. This is likely to be a problem if they're used in pendant fittings. I'd normally agree but bear in mind that these are for special fittings so you can't swap to an LED - you'd have to change the whole fitting. These used to be so expensive,we bought a new house I years ago and every fitting we're for these.heat for the current price tho. Voted hot. But better to change these and put led bulb instead . These do not last very long and full of mercury. If you just want MR16 , dimmable or not, look at Screwfix. You want dimmable MR16? Is that your goal? MR16 run at 12V generally. GU10 generally are mains voltage. Also inset MR16 will stick out if you use some sort of converter. Not sure how much this normally is but for a £10 extra on top of normal white bulb with dimmer this seems ok price? Good deal. Heat added! For the hall, you probably don't need Ambience. Ambience is adjustable colour temperature (warm reddish white, cold bluish white). I'd have thought you'd be better off with a the cheaper plain white kit saving you a tenner. Yes definitely, even just for the visitors. I feel like i need to buy a Dimmer but don’t think I will use it as we just use the phone or ask Alexa to change it. Are they good to have? I get it. This is what you think a tissue looks like. Again, wrong item. Dimmers and LED lamps often don't play nicely together, particularly touch lamps. You do realise the OP has posted both ES and BC?